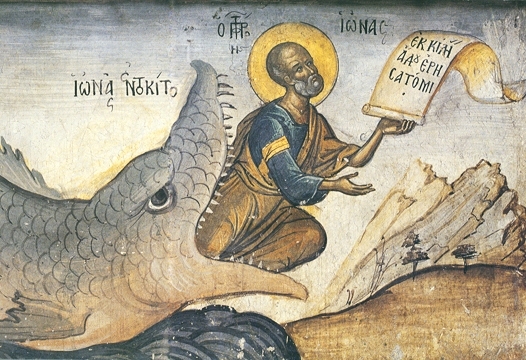 The holy Prophet Jonah was the son of the widow in Zarephath of Sidon who was raised from the dead by the Prophet Elias (Elijah). He lived in the eighth century before Christ. Called by God to preach repentance to the Ninevites, Jonah ran away, taking a ship to Tarshish, but God sent a great storm to the ship at sea. It was determined correctly by lots that it was because of Jonah that all were in peril of drowning. The Prophet asked them to throw him overboard, and when they did, the storm ceased. A great fish swallowed Jonah whole, and Jonah lived, praying to God for three days and three nights in the belly of this great fish, and then was vomited whole onto the shore. Now Jonah was willing to do God’s Will and went to Nineveh to preach. The Ninevites repented, which made the Prophet angry against God for His Mercy. Yet when the Prophet went out of the city and sat under a plant which God had grown especially to shade him, he was glad. God then withered the plant and spoke to him, showing and teaching him the blessings of mercy which He had had on Nineveh and on the now humbled prophet.